There are 16 Memory Care Facilities in the Rio Rancho area, with 5 in Rio Rancho and 11 nearby. The average cost of memory care in Rio Rancho is $4,133 per month. This is lower than the national median of $4,650. To help you with your search, browse the 14 reviews below for memory care facilities in Rio Rancho. On average, consumers rate memory care in Rio Rancho 5.0 out of 5 stars. Caring.com has helped 8 families in Rio Rancho find high-quality senior care. To speak with one of our Family Advisors about memory care options and costs in Rio Rancho, call (855) 863-8283. Rio Rancho, New Mexico, is nicknamed the City of Vision for its thriving technology scene, but its wonderful weather and low cost of living have also made it a popular retirement choice for seniors. About 13.8 percent of the population is age 65 or older, which includes a significant number of people with Alzheimer's disease or other forms of dementia. Residents have five memory care facilities to choose from in Rio Rancho itself, and an additional 13 are located in the neighboring city of Albuquerque and other nearby communities. 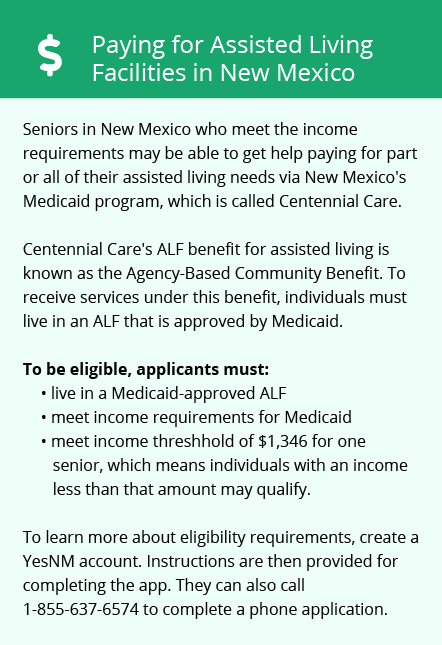 These facilities, like all assisted living facilities (ALFs) in the state, are regulated by the New Mexico Department of Health. Memory care facilities are held to more stringent regulations than other types of ALFs. Rio Rancho's weather is generally warm, dry and sunny, although residents can still enjoy four distinct seasons. It typically only gets about 11 inches of snow a year, much of which melts within a day or two, making it easy for seniors to get around during winter months. Summers can be hot, with average highs in the low 90s. Winter months typically have highs in the upper 40s or mid-50s, though temperatures regularly dip below freezing at night. The crime rate in Rio Rancho is fairly low, particularly when compared to the neighboring city of Albuquerque. It is ranked at 17.1 for violent crime, which includes robbery, compared to Albuquerque's ranking of 61 and a national average of 31.1. Property crime rates are somewhat higher, but still well below local and national averages. Some caution should still be taken to prevent theft, but it is generally a safe area for seniors to enjoy. New Mexico is somewhat tax-friendly for seniors. All retirement benefits, including social security, are eligible for taxation, although seniors who meet certain income requirements can deduct up to $8,000 annually. The state also has a relatively high effective sales tax due to its gross receipts tax policies, but groceries and prescription medications are exempt. The Rio Rancho area is home to world-class medical facilities, including those specializing in brain health and dementia care such as UNM Sandoval Regional Medical Center and Presbyterian Rust Medical Center, in the event of medical emergencies or illness. Memory Care costs in Rio Rancho start around $4,133 per month on average, while the nationwide average cost of memory care is $4,778 per month. It’s important to note that memory care rates in Rio Rancho and the surrounding suburbs can vary widely based on factors such as location, the level of care needed, apartment size and the types of amenities offered at each community. Learn more about these programs, plus who’s eligible, on our Memory Care in New Mexico page. For more information about different ways to finance memory care, visit our Memory Care in New Mexico page. Rio Rancho and the surrounding area are home to numerous government agencies and non-profit organizations offering help for seniors searching for or currently residing in an assisted living community. These organizations can also provide assistance in a number of other eldercare services such as geriatric care management, elder law advice, estate planning, finding home care and health and wellness programs. To see a list of free memory care resources in Rio Rancho, please visit our Assisted Living in New Mexico page. Rio Rancho-area assisted living communities must adhere to the comprehensive set of state laws and regulations that all assisted living communities in New Mexico are required to follow. Visit our Memory Care in New Mexico page for more information about these laws.